Johannesberg, Jo’berg, Jozi. It goes by many names, but it is all the same city…Johannesberg, South Africa. When we planned to come here with my parents, my brother said, “Oh, so your going to have our parents come to one of the most dangerous cities in the world to visit? 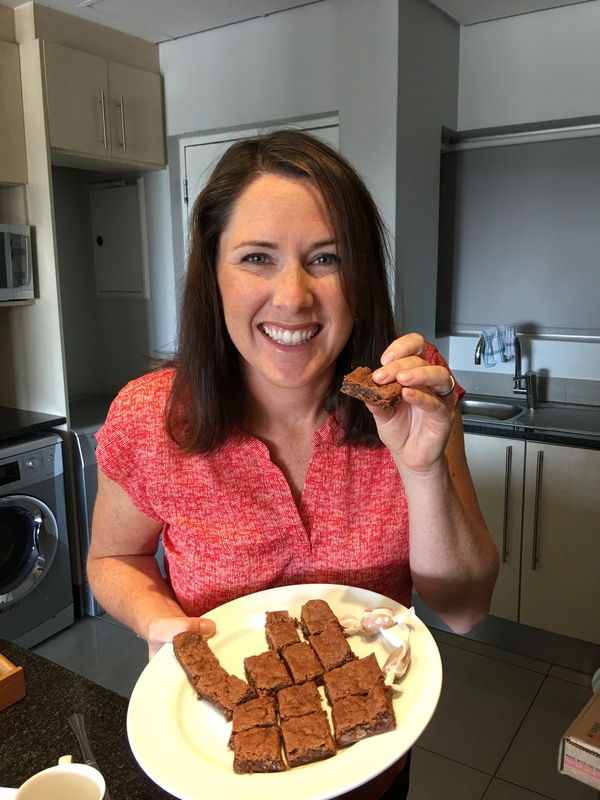 Nice, Jocey (note the sarcasm).” My other sister was talking to a friend and she said, “There is no way they are in Johannesberg, it is too dangerous. 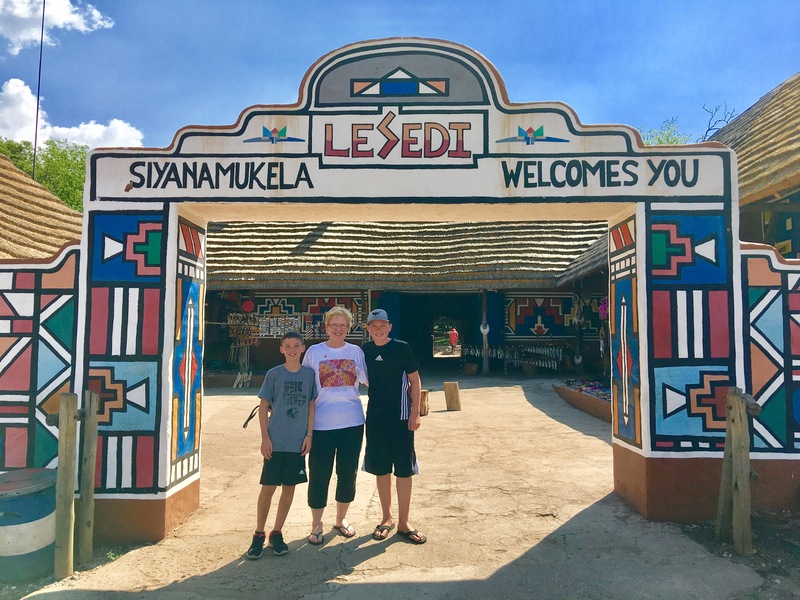 People don’t go there.” Well, we were there, and we actually ended up being there longer than anticipated due to our early departure from Botswana. Fortunately, we had a pleasant and safe experience by following some basic precautions to stay safe…our hotel was in the nicest area, it had fences and armed guards, we NEVER drove at night (we’ve been told if you live there long enough, you are guaranteed to have been carjacked or have someone close to you have been carjacked), and we didn’t go exploring into areas we didn’t know on our own. The boys doing schoolwork in our hotel in Johannesburg. Parker at home in the top of a Jacaranda tree. We were fortunate to come when they were all blooming and it was a beautiful sight as we drove through the area to see all these pops of purple among all the green trees. The natural landscape here is actually savannah, but with over 6 million trees of all kinds, Johannesburg is most likely the world’s largest man-made urban forest. Jo’berg actually has a lot to offer and I’m really glad we ended up having a few more days here than we originally planned. 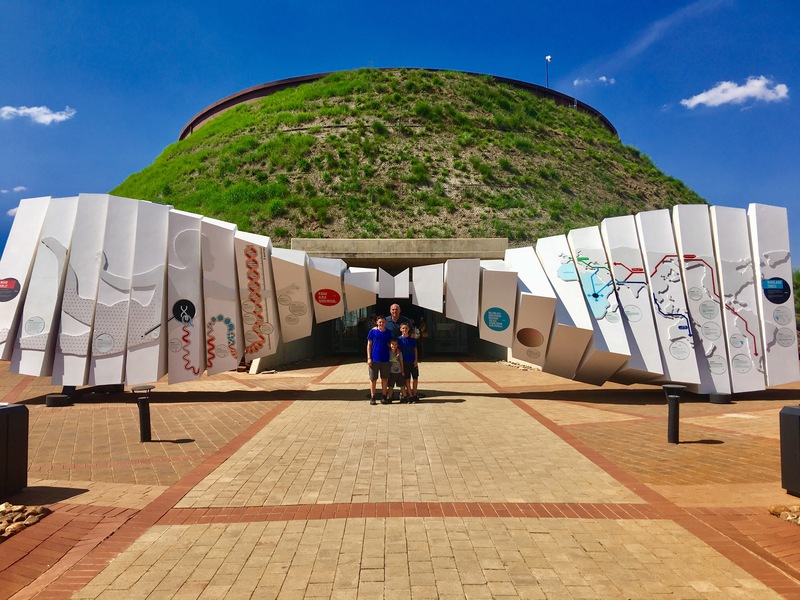 The most popular tour in the area has to be the tour of Soweto, or Southwestern Townships. 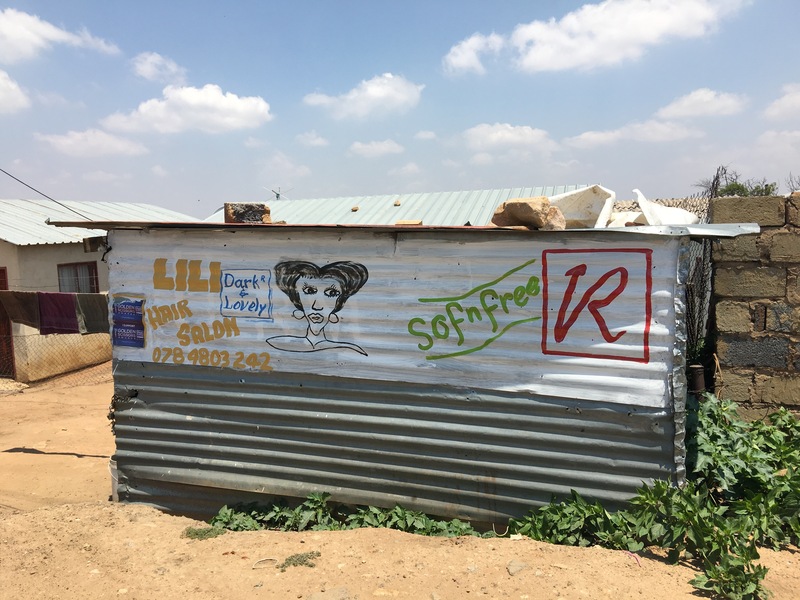 This area has everything from sheet metal slums to middle class areas and is a major cultural center in the Johannesburg area. 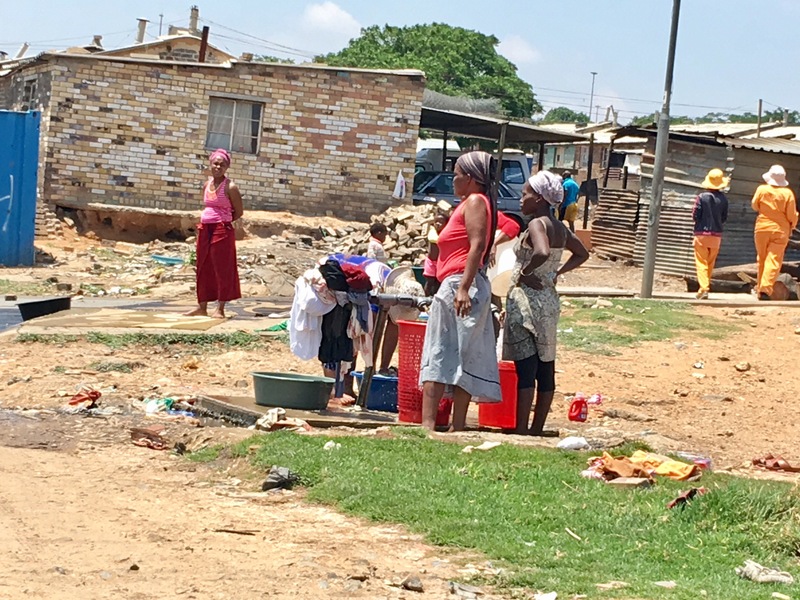 This is the neighborhood where Nelson Mandela and Desmond Tutu lived. They actually lived on the same street, making it the only street in the world where two Nobel Prize winners lived! In preparation for coming to South Africa, I read Nelson Mandela’s autobiography A Long Walk To Freedom so I was really looking forward to seeing where this great man began to develop into the incomparable leader he became. Below are the highlights from the tour. 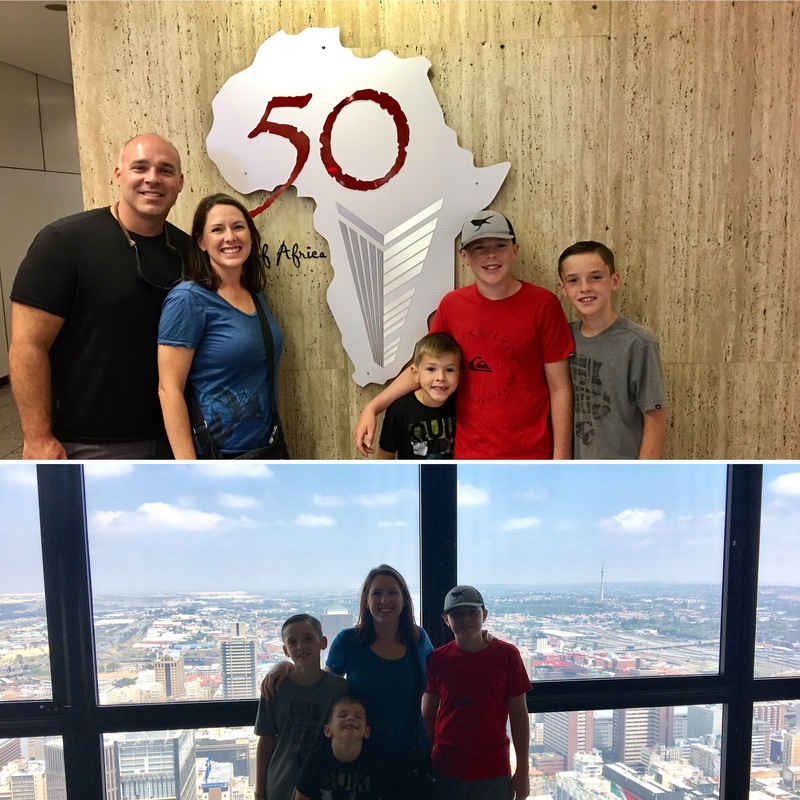 We started our tour at the tallest building in Africa, The Carlton Centre of Johannesburg. It was 50 stories tall, not quite the Burj Khalifa, but it was still cool to see the views over Jo’burg from the top. The downtown area is not very nice and has many abandoned buildings. We also drove by an area where rioters had burnt a bus the day before, which was a little unnerving. 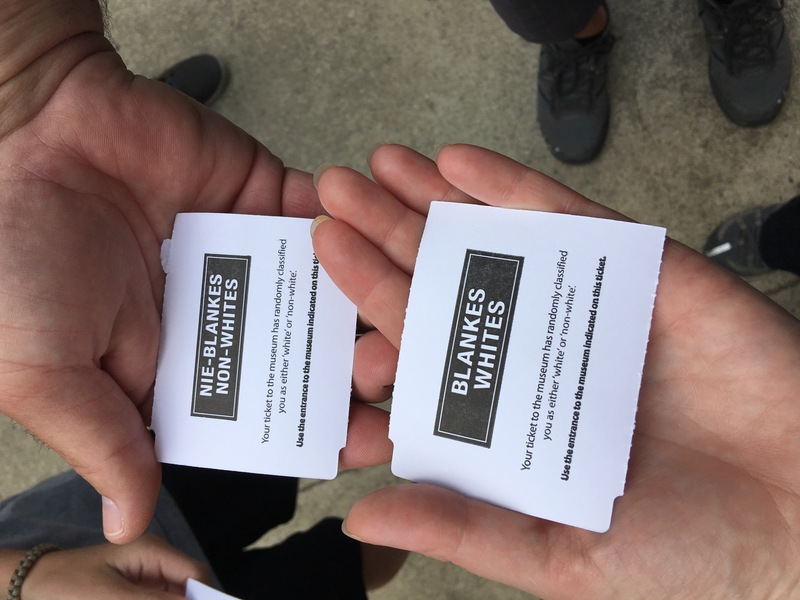 These are the tickets to get into The Apartheid Museum. They randomly assign you as a white or non-white and you enter through separate entrances just as people were forced to do during apartheid. The museum was very informative and an incredibly intense experience about the beginning, middle, and end of the atrocity of Apartheid in South Africa. This picture was taken at the Hector Peterson memorial. Hector was a 15 year old boy who died during a student protest against apartheid and specifically the new rules about education. This memorial is in memory of him and all those who lost their lives in the struggle against apartheid. 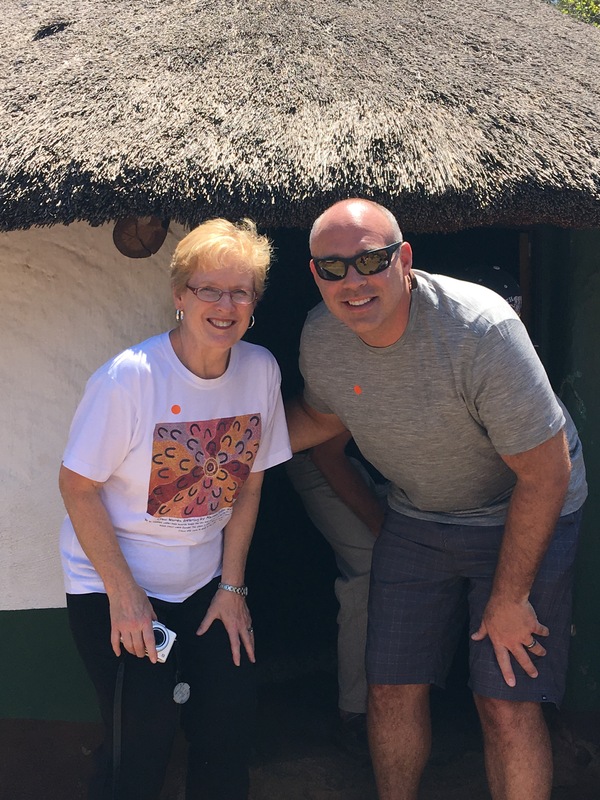 Seeing Nelson Mandela’s home was a highlight for me. 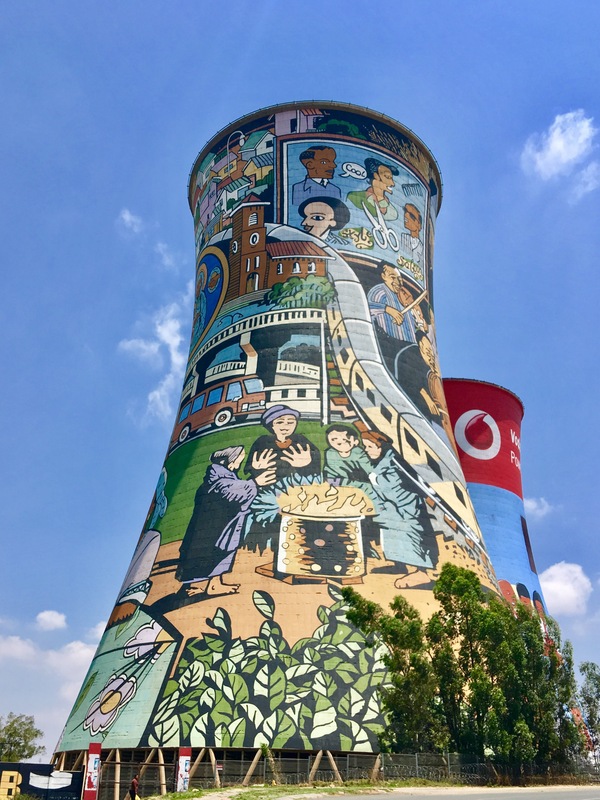 This former cooling tower for a coal power plant is now a landmark of the Soweto area with murals depicting the area surrounding it. 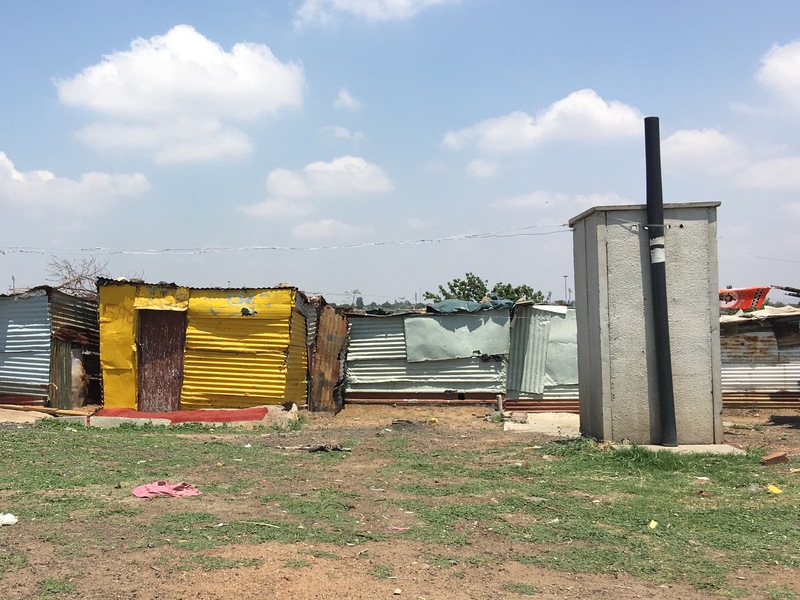 These are some of the “shanties” found in Soweto and similar are found throughout South Africa. The government has installed toilets (grey rectangle above) and water pumps (below), but they have to be shared by many people. Electricity is often stolen from poles in the area so some of the homes have limited electricity. If I had to pick one thing most people think of with Africa it would probably be the animals. 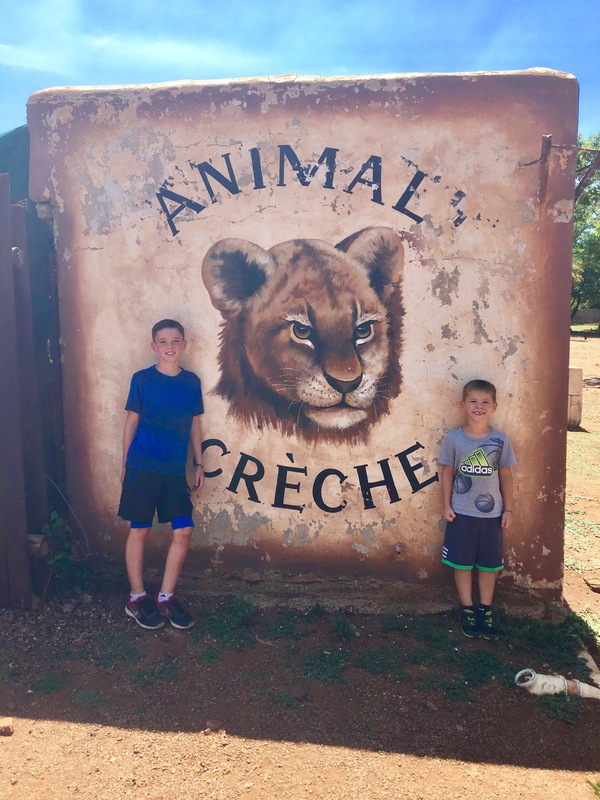 We were able to go to a reserve outside of Johannesberg and visit an animal creche and pet a bunch of different baby animals. The most memorable are the 4 month old lion and tiger cubs! 4 months sounds young, but they were actually pretty big! 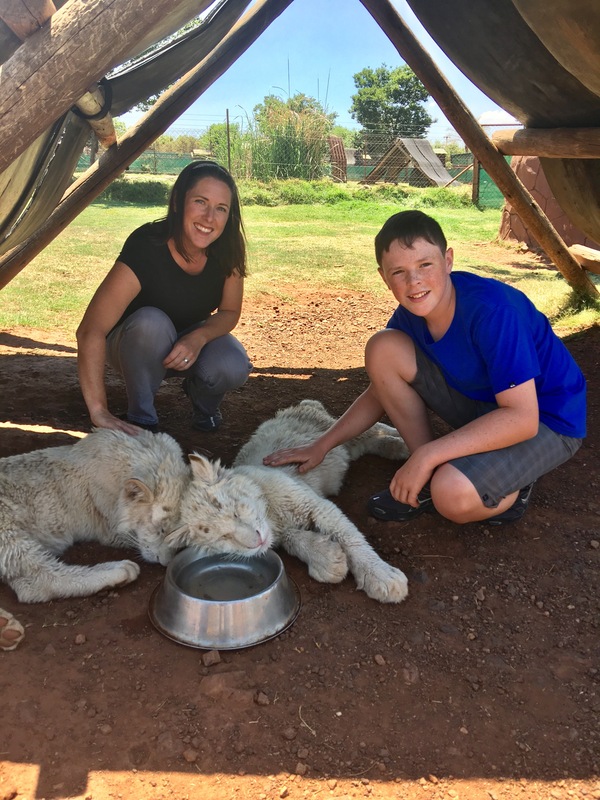 We had a fun time getting up close to the animals in a safe environment although after seeing them in the wild, you can’t really compare the experiences. We definitely wouldn’t have been able to get this close in the wild! 4 month old Bengal Tigers. That is a huge paw on that lion for only 4 months old! The fact that we are “world schooling” as we travel around the world causes us to change topics depending on the region we are in. 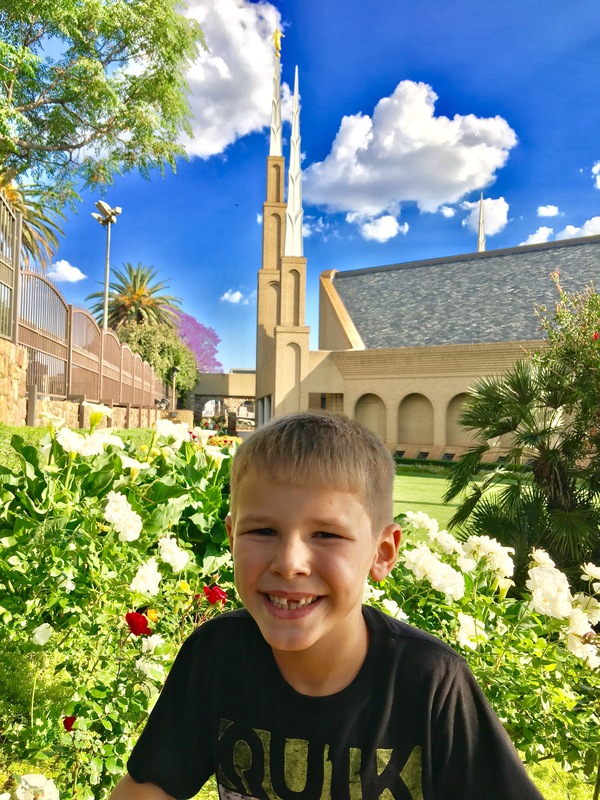 For example, in Rome, we learned about ancient Roman history, in Germany, WWII and The Brothers Grimm, and for science in Botswana we were learning about mammals, ecosystems, and plant life. We continued the things we were covering in Botswana in South Africa, but we also had the unique experience of visiting the World Heritage Site, “The Cradle of Humankind.” This is a region near Johannesburg that has become a world renowned paleoanthropological site (place for studying ancient fossils). 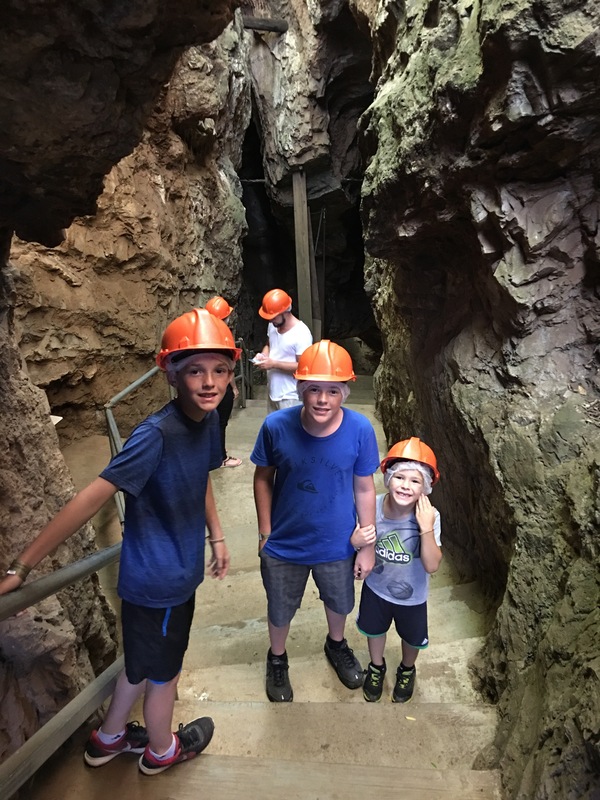 The limestone caves in this area known as Sterkfontein have produced more than a third of the early hominid fossils found to date. 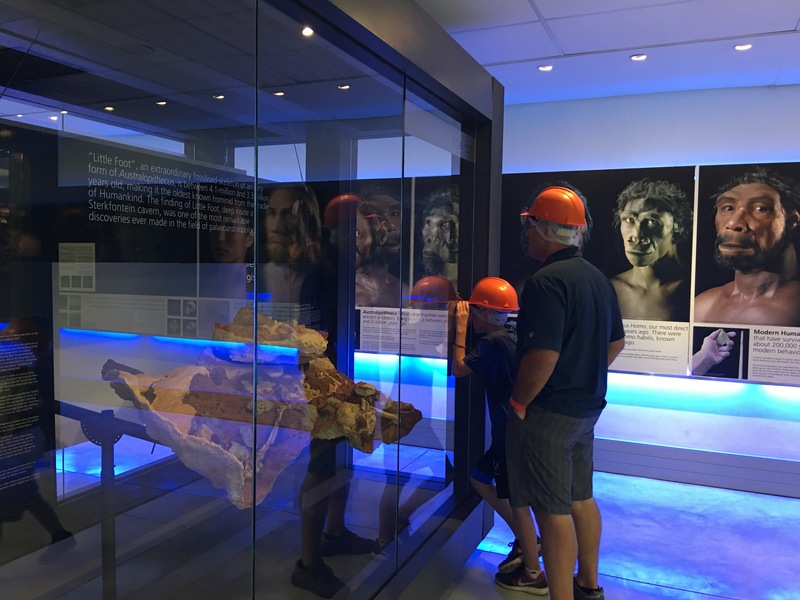 We were able to go in the caves where “Little Foot,” a near complete Australopithecus fossil skeleton possibly dating back 2.5 million years was found from 1994-1998 . They had a fabulous museum and visitor center on site covering the history of the earth, DNA, ancient fossils, and much more. We could have spent much longer than we did there, but we had a fabulous and very educational experience. While there, I was humbled by the enormity of creation and reconfirmed in my convictions of us having a divine, benevolent Creator who made this incredible world for us to experience human life. 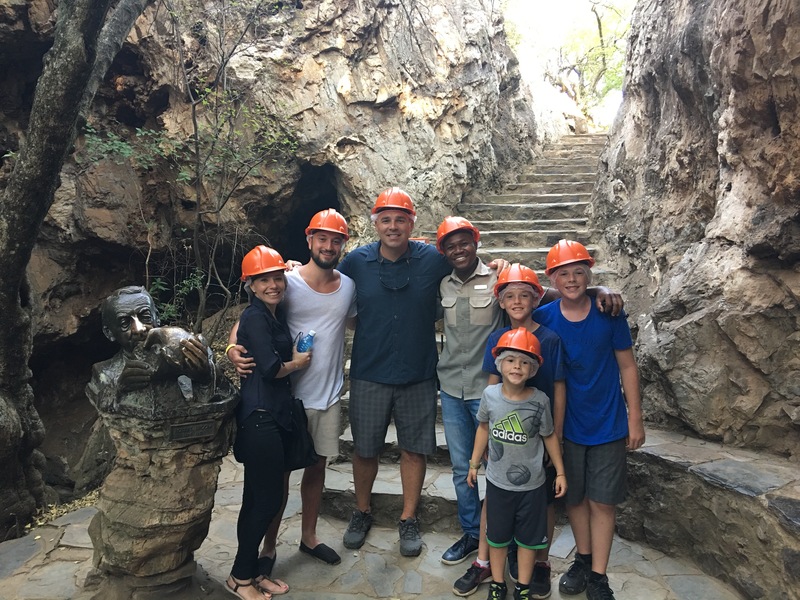 We had a great tour of the caves and an enlightening discussion with some of the other travelers while visiting. Of all the things that happened in Johannesburg, the most exciting was when my Mom and Dad came to stay with us! Before we left home they chose South Africa as the place where they wanted to visit us. We had a ton of fun planning the time when they would be with us and we counted down the days until we were able to see them. Their flight arrived at 6:00 AM and they planned to take a taxi from the airport. We were all so excited that we couldn’t sleep the night before and then we all got up at least an hour before they even got there (we aren’t morning people so this is a big deal for us). It was like waiting for Christmas morning, but instead of presents and a yummy breakfast we got to see family and have homemade treats! We had been enjoying (most of the time) only each others company 24/7 for the previous four months (except for a couple of days in Paris with our friends the Smith’s) and we were so excited to see family. We were also excited to have someone else to share our adventures with! 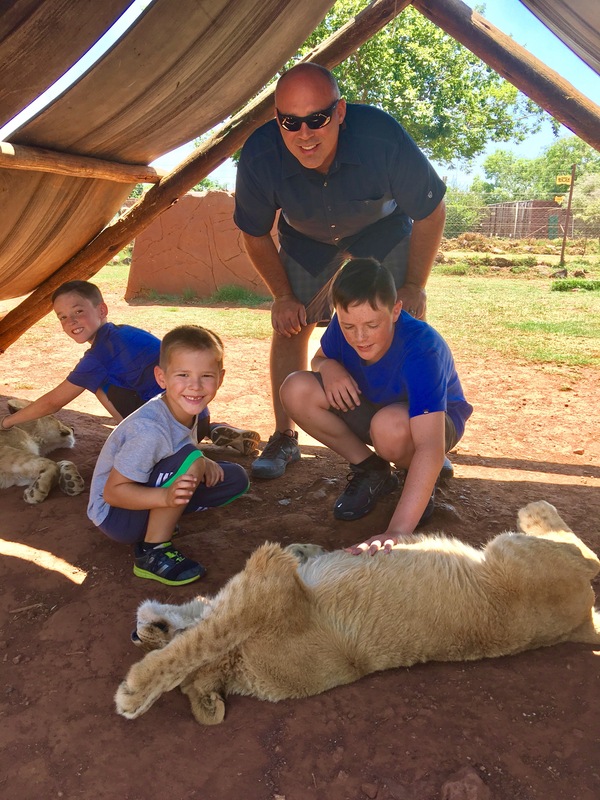 I don’t think the boys stopped talking the entire 6 hour drive to our safari and most of the rest of the time my parents were there. It was so great to see family and have them experience what life is like for us on the road. After arriving, my parents took a nap and then we headed out for the day hoping to assist them in overcoming jet lag. 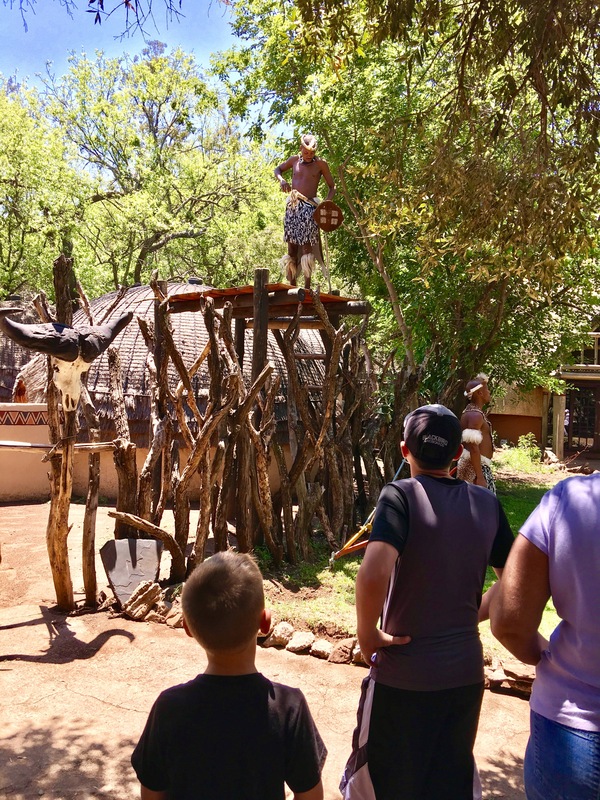 We had a really fun day at the Lesedi Cultural Village which has traditional villages from five different South African tribes and educated you about each of them. 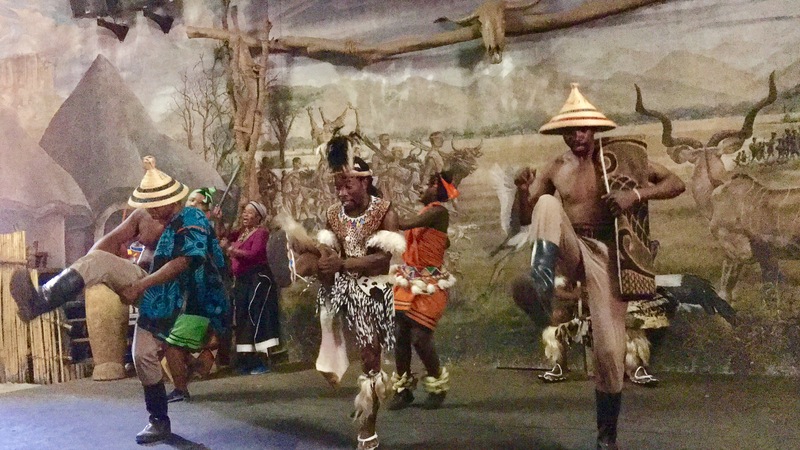 They also had an entertaining music and dance presentation, followed by an African feast. My parents hadn’t been there 8 hours and we already had them eating crocodile and ostrich! They did pass on the dried worms, but Tyler gave them a try! 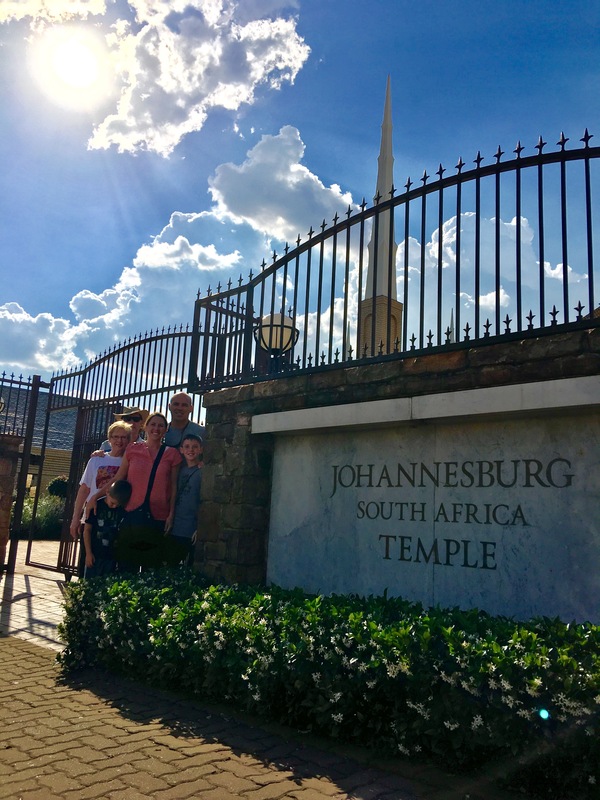 After the village tour, we drove to the Johannesburg, South Africa LDS Temple. It was a beautiful, peaceful place to be with family. 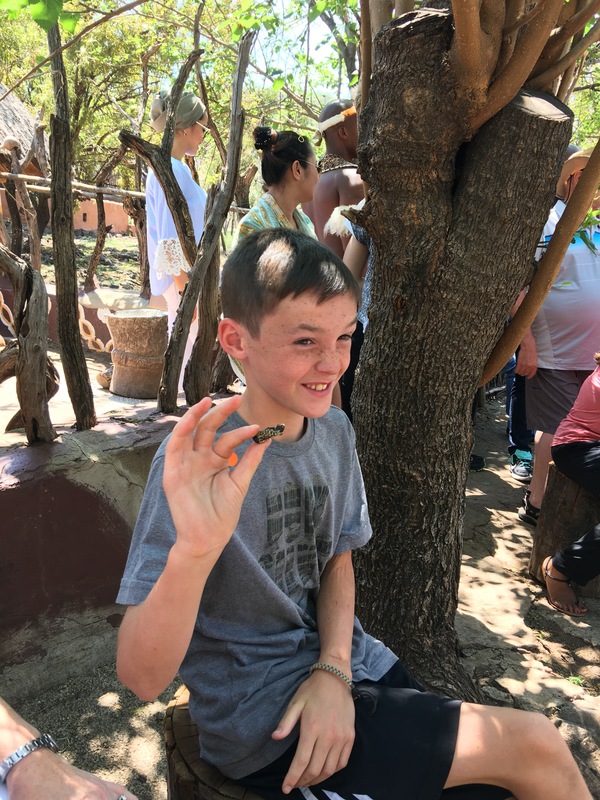 Tyler tried the dried worms…they weren’t as good as he was expecting! 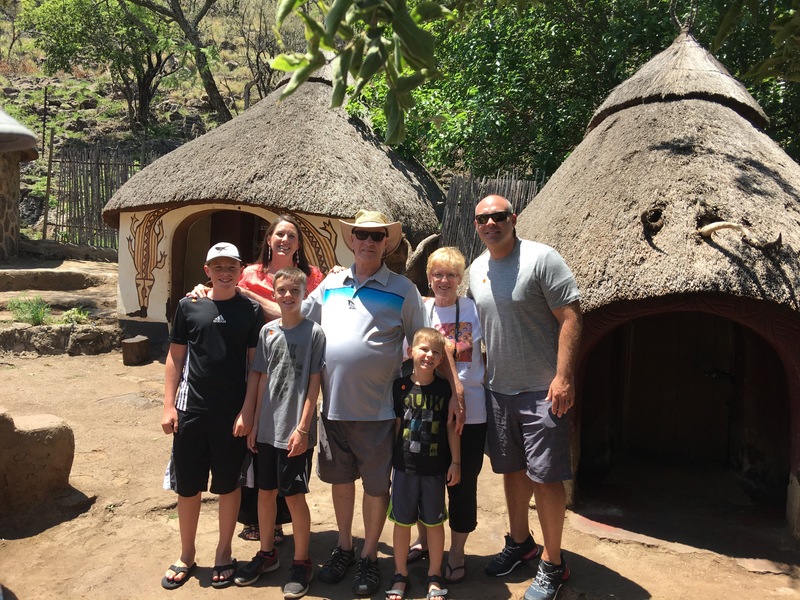 After doing our best to keep my parents up all day to combat their jet lag, we headed back to the hotel to rest before our 6 hour drive into the mountains and on to the Kapama Game Reserve the next morning.